I seem to be in a photographic rut lately, but the insect world has presented some opportunities too good to ignore. 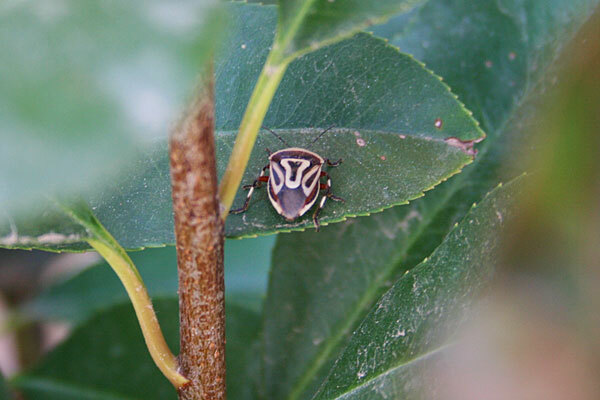 I spotted this unknown variety of shield or stink bug on one of the red-tipped photinia in our front flowerbed. 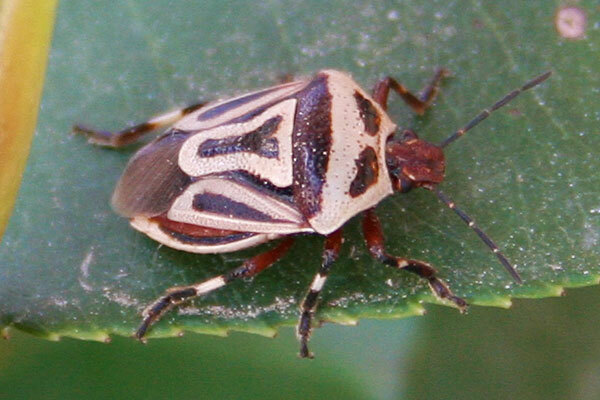 I browsed in vain through more than 500 photos via Google's image search without finding a match for this particular coloration and pattern, but I suspect there are thousands of variations. Anyway, I don't recall ever seeing one quite like this. This page contains a single entry by Eric published on September 1, 2009 6:06 AM. Heavy Backyard Air Traffic was the previous entry in this blog. Newsflash: Motorists are hazardous to bicyclists' health is the next entry in this blog.